Check back regularly for updated Rules and Regulations. A BYLAW of the Palliser Regional Park Authority, in the Province of Saskatchewan, to provide for the health, protection, safety and general welfare of persons and property within the park. A BYLAW of the Palliser Regional Park Authority, in the Province of Saskatchewan, to provide the abatement of nuisances within Palliser Regional Park. A BYLAW of the Palliser Regional Park Authority, in the Province of Saskatchewan, to provide regulations to matters relating to constructing, erectiing, placing, altering, repairing, renovating or reconstructing a building. This PDF document contains the rules and regulations that apply to permanent trailers for the 2015 camping season. This PDF document contains the rules and regulations that apply to seasonal sites for the 2015 camping season. Given issues in previous years in all parks in Saskatchewan, the PRP Board Authority has taken the decision to ban alcohol in the park on Victoria Day weekend. This is now enforced by an order from the Minister of Parks, Culture and Sport. The signed Minister's Order banning alcohol in parks across Saskatchewan, including Palliser Regional Park. 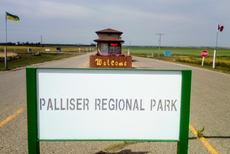 Palliser Regional Park no longer has a Waste Disposal Ground. Neither does the Village of Riverhurst. Much like any municipality we are now having to deal with waste in a different manner than we did in the past. The large blue bins that have been in the Park for the past two seasons are for bagged household garbage only. This waste is then hauled to Swift Current. The more these bins are filled with lumber, old chairs, renovation materials, leaves, grass clippings, etc. the more the park has to pay to have the bins emptied and the refuse hauled to Swift Current. Metal items, like old barbeques, broken lawn chairs and anything else that is left beside the bins will have to be hauled to a recycler. Again, loading and hauling these items to the city will continue to incur costs. Unfortunately, these extra costs will have to be passed on to park patrons through various increases and cost recovery fees. It is for this reason that we ask that you please do your best to remove any waste that you produce. To help alleviate the pressure on the bins, two disposal sites are available to patrons - one for leaves, and one for tree branches. Leaves can be taken to the leaf disposal ground. This area is for leaves only. No tree branches please. Tree branches can be taken to the disposal ground known as the Boy Scout Dump. Only tree branches here please! If you don't know where either of these locations are please contact the office for directions. Well mannered pets are welcome. Pets must be leashed or crated at all times. A maximum of two pets allowed per site. Pet owners must clean up after their pets immediately. In consideration of other guests, excessive barking or aggressive behavior will not be tolerated and you may be required to vacate.